Beaver Island has some of the highest quality natural areas in the State of Michigan and is ranked as one of the most biologically diverse islands in the Great Lakes, but invasive species if not controlled can change the natural diversity of our islands – and our economy. To attract visitors and new residents, we need to display our natural resources in their best invasive-free environment. Right now there are less than a dozen invasive species on the Island, some a bigger problem than others. One of the worst, Phragmites, has been controlled by early identification and rapid response with support of the Michigan DNRE, townships, and private property owners, coordinated by the townships’ Phragmites Administrator, Jacque LaFreniere. But we can’t stop with Phragmites. New to the Island are European Swamp Thistle and Japanese Knotweed. In the next 20 years, Beech Bark Disease in our forests is predicted to kill 80% of our Beech trees. Thankfully, the Emerald Ash Borer has not been introduced to Beaver Island, and isolation from the mainland may make our Ash trees a future visitor attraction, since elsewhere in the Midwest they may be seen only in text books. Kevin McDonough’s Ash tree stump at the boat dock with a notice to not transport firewood to Beaver Island is an example of effective individual attempts to protect our Island’s forests. Continue to read local publications and visit BIA’s website to learn about invasive species on the Island, and spread the word if you find one. Plant only native species; be sure plants you bring to the island aren’t invasives; if transferring plants, remove most of the soil from the roots. 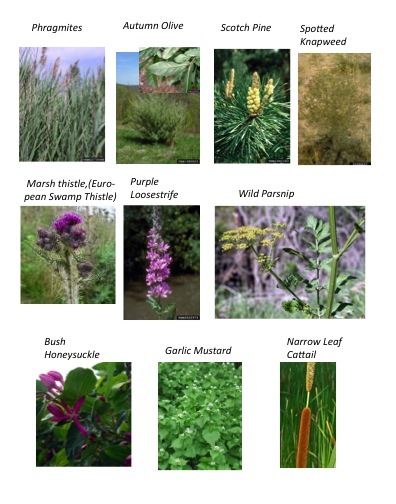 Identify and control strange plants on your property that spread from original boundaries; web-search invasive species; visit www.invasive.org, orwww.invasivespeciesinfo.gov. Use our access to Michigan Natural Features Inventory staff and other botanists to assist in plant identification. 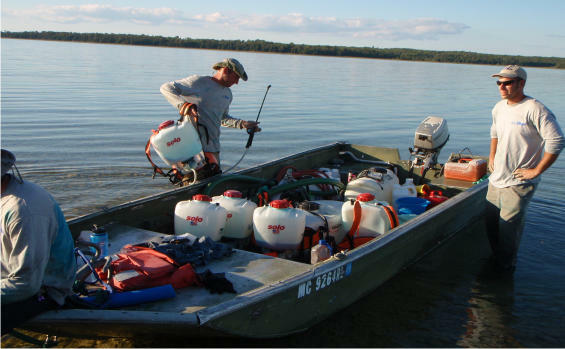 Clean boat or leave out of water four days before taking it to another body of water and don’t release fish, plants, live bait or other exotics into the wild. For more information or questions, please feel free to call me or email: pgrassmick@gmail.com. This year’s plan for Phragmites monitoring and treatment will be drastically different from past years. A Phragmites administrator will be hired by the townships this spring. He/she will set up a system of beach volunteers–sort of an Adopt a Beach program–under a plan developed by the Natural Resources and Ecotourism Commission (of Beaver Island). These volunteers will check their beaches for the presence of Phragmites and later be trained by the DNRE to treat it. This will save substantial funds. We have so little of it currently on our beaches that it really doesn’t justify the cost of hiring a company to come here and treat it as in the past. Also, the DNRE will secure the necessary permits and provide the treatment chemical. The DNRE will treat phragmites on High Island and will hire professionals to treat Hog Island. Beaver Island’s Phragmites project has been presented and discussed on various levels across Lake Michigan, Lake Charlevoix, and northern Lake Huron. Based on the positive Beaver Island results for a rapid response to an invasive species such as Phragmites, the Michigan Department of Environmental Quality will offer other communities similar township/county wide permits for herbicide treatment thus allowing for large tracts of shoreline owners to participate. In addition, it is expected that funding will be flowing from Washington for work in preserving our state’s coastal wetlands. It cannot be left to government intervention alone to solve the precious wetland crisis. It will necessitate that property owners fully understand the consequences of their stewardship practices in terms of habitat, water quality, and enjoyment of our Great Lakes. Examples of constructive Phragmites programs being undertaken can be found at www.charlevoixcd.org. Kelly Martin from the Charlevoix Conservation District has put together a wonderful web site. The Grand Traverse Watershed Council hosted a Grand Traverse Regional Phragmites workshop on June 6, 2009 and updates can be found at www.gtbay.org. Also Huron Pines is developing a Cooperative Weed Management Plan for northwestern Lake Huron to target several invasive plant species, including Phragmites. As for our little corner of the world, in January, a letter was signed by both township supervisors, requesting that those Beaver Island shoreline owners who did not have a current permission slip on file submit a new form. The letter went on to discuss that as a last resort under last year’s adopted ordinance where invasive Phragmites is found, treatment action will be taken even without the owners’ consent but only after written notice is sent to the property owner’s tax address, public notice in local papers, and possibly court action. We have had a tremendous return response from this request which will be used to update our GIS (Geographical Information System) maps for the 2009 island-wide survey. As you will recall, our first treatment year was so successful that 27.1 acres was reduced to 3 acres. In 2009, we expect acreage needing to be treated to be even less. Our 2009 SOS program is fully funded; no donations will be required. During a recent planning conference call, Brian Mastenbrook from the Michigan Department of Natural Resources again offered his department’s assistance with the permitting and award of the bid. The next mass mailing will take place in August to shoreline owners outlining the anticipated treatment dates and the chemicals to be used. Last year, 80% of all Phragmites was hand swiped directly to the Phragmites plants. A meeting with the herbicide contractor will take place prior to herbicide application in late August. In addition, the DNR will also continue to treat the infestations on the outer islands. The composition of the team may change from year to year but the same commitment to preserving our shoreline is evident. The townships have hired Jacque LaFreniere as the Phragmites Administrator for 2009. Beaver Island exemplifies the point that small isolated communities can achieve an ecological victory by working together. Every property owner that contributed any dollar amount or signed a permission slip to the Save Our Shoreline project should feel a sense of pride in this preservation project. We are still in need of additional property owners’ permission for a Phragmites survey and treatment. Phragmites has been identified near or on your property. Due to the generosity of your neighbors, treatment planned for the summer of 2009 already is fully funded, so this letter’s purpose is not to request more funding to treat the Phragmites on your property. 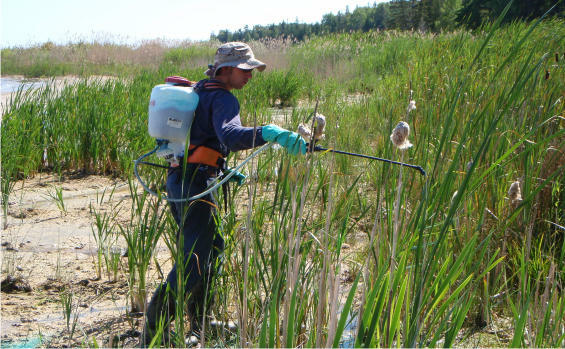 In 2007, herbicide treatment was applied to 27.1 Phragmites infested shoreline acres. It was so successful that this past treatment season saw a total of only three acres being targeted. In 2009, we expect acreage to be treated will be even smaller. By combining our interest in controlling this invasive specie along with available funds, we are able to provide a cost efficient and effective program under controlled conditions by hiring a level 5 certified contractor, but we do need you to help by filling out and returning the enclosed form. Please review the enclosed card, check the appropriate boxes, and return it to us within the next 30 days. This will allow for a yearly shoreline survey and treatment in the event that Phragmites is found. Last year, a Phragmites eradication ordinance was passed by both townships in an attempt to preserve habitat and property values. As a last resort, where invasive Phragmites is found, treatment action can be taken even without owners’ consent, but only after written notice sent to the property owner’s tax address, public notice in local papers, and possibly court action. For obvious reasons, we all would prefer to avoid that so it is our sincere hope that you will review the materials, return the card, and join our island community in this mission to save our Beaver island shoreline. We also ask property owners to keep in mind as you manage your shoreline that the first line of defense against Phragmites is native shoreline vegetation which provides essential wildlife habitat and improve the water quality of the Great Lakes. While the Lake Michigan Lakewide Management Plan discusses the deteriorating trend of our coastal wetlands, Beaver Island can be proud as a community of our collective response to our vulnerable shoreline. The 2007 Phragmites eradication project (SOS) was very successful. This year, 80% of the remaining Phragmites were hand swiped vs. sprayed. We have gone from treating 27+ shoreline acres to approximately 3 acres in one year. In true Island spirit, this is cause for celebration! In the hand-swiping process, the dye is not seen on the sand but rather on the stem of the plant. The blue green nature of the dye mixed with the herbicide can be very discreet on the greenish blue leaves, but, make no mistake, the herbicide is just as effective. Photos are available on our website as well. Over 300 property owners entered into the treatment program voluntarily. Our shoreline presented many new growth areas and those were targeted so that seed heads did not establish. A map showing individual Phragmites sites on Beaver Island along with property owner information can be found at the Beaver Island District Library or on the BIA website. The information returned from the JF New treatment team was very positive. They were grateful for the enthusiasm with which they were greeted along our beaches and commented on the Island residents’ comprehensive understanding of the Phragmites plants and the project. Shoreline owners met with the contractor, Don Vyse representing the townships and Pam Grassmick for the BIA on August 26th. This opportunity provided a chance to have questions answered. The response from those in attendance was very positive. You can expect this meeting to be repeated in the 2009 treatment year. What can you as a property owner on Beaver Island expect over the next year? First, the Phragmites plants will be turning yellow as fall approaches. Those individuals who have Phragmites growing on their beaches and have not submitted their permission slips will be contacted by mail with a formal request from the townships prior to enforcing the Ordinance which was passed in August of 2008. If seed heads are present on your Phragmites plant, research tells us that the plant is at least three years old. As part of an ongoing monitoring program, another entire shoreline survey will take place in June of next year. Mapping of infestations and an evaluation of treatment areas will occur. Further community discussions will entail designing a sustainable treatment program. As with programs of this type, maintenance will go along with shoreline restoration work. Cutting the dead stems can occur three weeks after herbicide treatment. Again, taking care to not disturb the soil, burn them on your property or bag and take to the Transfer Station. Please refer to the 2008 Spring Phragmites update on beaverislandassociation.org for further removal instructions. Your stewardship of the Island’s beaches is testimony to the deep sense of community and commitment to preserve and protect our shoreline. I personally extend a note of thanks to each of you who have taken the time and energy to understand this program and the threat to Beaver Island. Your funding, along with the townships’ dollars, kept this program feasible. Another note of thanks to our township supervisors, Don Vyse and John Works, Jr., both of whom worked tirelessly to achieve another successful treatment season. Brian Mastenbrook, from the MI Department of Natural Resources, assisted in securing the permits and awarding the bid to a very professional treatment company, JF New. Brian also secured the funding for treatment of Beaver, High and Garden with a grant from the US Fish and Wildlife Service. Brian Kelly deserves honorable mention for his assistance with the maps from Charlevoix County’s GIS Office. Stay tuned for Part III in the 2009 Phragmites saga. Click here for more Information on Invasive Phragmites and the 2008 SOS Program and the Phragmites Treatment and Inspection Permission Form that all shoreline property owners are asked to return. Click here to see a Phragmites Map (PDF) which shows the GPS-mapped phragmites locations around Beaver Island. In the hand swiping process, the dye is not seen on the sand but rather on the stem of the plant. The blue green nature of the dye mixed with the herbicide can be very discreet on the greenish blue leaves but make no mistake; the herbicide is just as effective. Photos are available on our website as well. Over 300 property owners entered into the treatment program voluntarily. Our shoreline presented many new growth areas and those were targeted so that seed heads did not establish. A map showing individual Phragmites sites on Beaver Island along with property owner information can be found at the Beaver Island District Library or on the association’s web site listed below. The information returned from the JF New treatment team was very positive. They were grateful for the enthusiasm that they were greeted with along our beaches and commented on the island residents’ comprehensive understanding of the Phragmites plants and the project. Shoreline owners met with the contractor, Don Vyse representing the townships and Pam Grassmick for the BIA on August 26th. This opportunity provided a chance to have questions answered and the response from those in attendance was very positive. You can expect this meeting to be repeated in the 2009 treatment year. What can you as a property owner on Beaver Island expect over the next year? First, the Phragmites plants will be turning yellow as fall approaches. Those individuals who have Phragmites growing on their beaches and have not submitted their permission slips will be contacted by mail with a formal request from the townships prior to enforcing the Ordinance which was passed in August of 2008. If seed heads are present on your Phragmites plant, research tells us that the plant is at least 3 years old. As part of an ongoing monitoring program, another entire shoreline survey will take place in June of next year. Mapping of infestations and an evaluation of treatment areas will occur. Further community discussions will entail designing a sustainable treatment program. As with programs of this type, maintenance will go along with shoreline restoration work. Cutting the dead stems can occur 3 weeks after herbicide treatment. Again, taking care to not disturb the soil, burn on your property or bag and take to the Transfer Station. Please refer to the 2008 Spring update on www.beaverislandassociation.org for further removal instructions. Your stewardship to the island’s beaches is testimony to the deep sense of community and commitment to preserve and protect our shoreline. I personally extend a note of thanks to each of you who have taken the time and energy to understand this program and the threat to Beaver Island. Your funding along with the townships’ dollars kept this program feasible. Another note of thanks to our township supervisors, Don Vyse and John Works, Jr., both of whom worked tirelessly to achieve another successful treatment season. Brian Mastenbrook, from the MI Department of Natural Resources, assisted in securing the permits and awarding the bid to a very professional treatment company, JF New. Brian also secured the funding for treatment of Beaver, High and Garden with a grant from the US Fish and Wildlife Service. Brian Kelly deserves honorable mention for his assistance with the maps from Charlevoix County’s GIS Office. The following letter and permission form was sent to shoreline property owners on June 1st, and can be downloaded for easy printing in PDF format here. It must be returned by June 24, 2008.
please download and print them from this link. 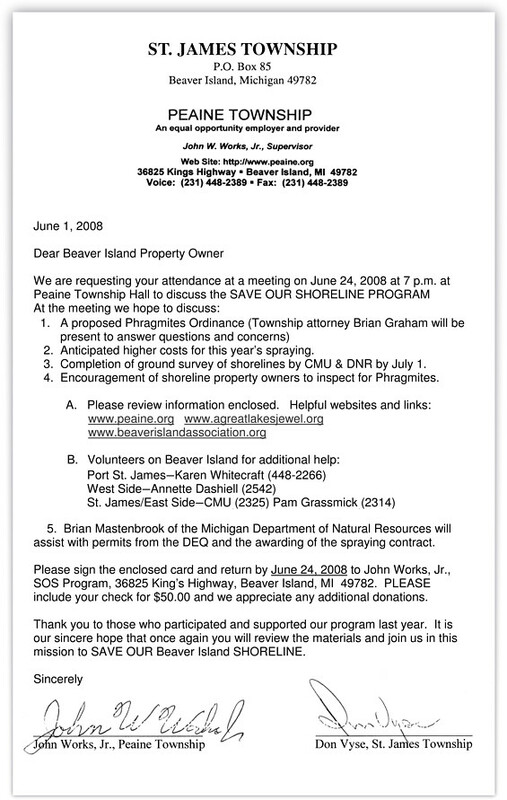 Shoreline owners and interested individuals are asked to attend a public meeting on June 24, 2008 at the Peaine Township Hall at 7.p.m. This meeting is to discuss the proposed 2008 Phragmites Eradication Plan (Save Our Shores Program). A letter will be mailed on June 1st to all shoreline owners outlining this year’s process. John Works, Peaine Township Supervisor, Don Vyse, St. James Township Supervisor, Brian Mastenbrook, DNR, and representatives from the Beaver Island Association (BIPOA) will be on hand to answer questions. We would also like to take this opportunity to thank those property owners who reviewed the information on Phragmites and participated in the treatment program. Thank you to all who participated in our 1st of many Phragmites control efforts or theSave our Shores Program. We are in the process of putting into place a revised 2008 treatment program which should be smaller in scope than our initial treatment last September. Brian Mastenbrook from the MI DNR has again offered his assistance with obtaining permits and the selection of the treatment company. He hopes to expand treatment to Garden and High Islands where small stands have been detected. The townships are addressing concerns of all Phragmites infected property owners participating in the program. The intention is to make the treatment as effective as possible while protecting the sensitive beaches which support the water quality of the Great Lakes along with wildlife habitat. In addition, property values can be affected which has the potential to erode Beaver Island’s tax base. It is with this in mind that the Beaver Island Association remains committed in their support of the project through all means necessary. Research indicates that the seed heads may be more viable than previously thought. Seeds are shed in late winter and the seeds remain dormant until April/May in our area. The stalks of Phragmites die yearly. The new growth comes from the root system. All the stalks, which we see along our shoreline, are dormant dead material. It is expected that late May, green plants will not be flourishing in treated areas. A survey of treatment results is already planned with DNR, townships, SEAS, and BIA’s representative. Bob Williams from Harsen’s Island is also battling Phragmites and offers the suggestion of using a 3.5” carbide circular saw blade on his weed whacker. This devise is similar to a tree or limb trimming saw. Upon property owner’s return, please inspect your shoreline. Remove all dead material. Please take care not to disturb the soil while cutting and removing seed heads. You may bag the seeds heads or place in small pile such as a fire pit and burn. One of the recommendations from the Michigan Department of Environmental Quality for larger denser stands is a tool called prescribed burn. It is only effective after an herbicide has been applied. If a burn takes place without the Phragmites being treated with an herbicide it will actually stimulate growth. Prescribed burns are to remove dense dead patches of Phragmites that may be a fire hazard next summer. It will remove stems and thatch and allow native species to regenerate. It will also make it easier to spot treat new growth. Again, a wealth of Phragmites information can be found at the BIA produced website: www.agreatlakesjewel.org. The entire Beaver Island community can high five each other for pulling together as we battle to save our shoreline from invasive phragmites. As you are all aware, BIPOA has worked years to educate Islanders about this threat. We recognized that Beaver Island had much at stake. Once phragmites is established, it decreases the biodiversity of native plants and animals and impacts the health of the Great Lakes. There was the potential to lose five endangered or threatened species. With the degradation of our beaches come decreased property values and ultimately the erosion of our tax base. Tourism and hunting dollars could have been affected also. John Works, Don Vyse and both township boards are to be commended for working tirelessly on the SOS Project. Today we are 27.2 acres lighter, which is the area that the Superior Environmental And Aquatic Services treated. Property owners will continue to notice their stands dying and turning brown through the fall as the herbicide moves through the root system. Professionals and researchers who work in the area of phragmites control have reviewed photos and the evaluation process will continue through next year. As we all knew going into this as a community, it will be an ongoing fight. Plans are already in the process for the 2008 fall treatment. The coastal shoreline will need to be reassessed and changes based on data and thoughtful review will be put into place. BIPOA will pursue policy changes within the DEQ which will address bottom land issues regarding treatment in areas severely affected by low lake levels. There is much work yet to be accomplished but for now we need to say thank you to our townships, thank you for your faith and funding of this project, thanks to all the various educational opportunities, and Brian Mastenbrook from the Michigan DNR who was an essential member of the team. The SEAS treatment group also deserves recognition for their sensitivity and attention to our fragile coastal wetlands. Please look for opportunities to serve with this project next year as we request help from volunteers this spring. Aerial and ground surveys have found increased infestations of the invasive weed, phragmites australis, on both the state and private Lake Michigan shoreline. There are also significant patches on Font Lake and Lake Genesereth. Mature stands are 8 to 10 feet high and extremely dense. In response to this threat, the Beaver Island Property Owners Association is helping coordinate an initial program in cooperation with the Michigan Department of Natural Resources and the townships. Brian Mastenbrook of the Gaylord MDNR office is applying for a permit for chemical treatment and state funding of application on state land by contracting with an experienced, insured, and licensed operator. The permit will include private land and offer shoreline landowners an opportunity to participate in a comprehensive program.. However, NO PROPERTY CAN BE CHEMICALLY TREATED WITHOUT WRITTEN PERMISSION FROM THE OWNER. This is expected to be a multi-year program in which the DNR will concentrate first on the Beaver Island shoreline and then move to the outlying islands where phramites are also spreading, primarily by wave action. The townships have budgeted initial amounts to participate in an inclusive program. Peaine Township has used a portion of its allocation to produce an informational DVD that will soon be available free in the library and the township office. BIPOA recommends that all who have property on any shoreline borrow and view this excellent source of information about identification and treatment. Treatment with a commercial-grade herbicide is done either with ground spraying or individually wiping stalks. A 20 by 20 foot patch will cost at least $100. Burning or cutting stalks without removing the runners will not kill the plants. The runners, up to 20 feet long and often 6 inches under the surface, can be pulled only early in their growth and with great effort. Retail-grade herbicide is not approved for application and unlikely to be effective on mature plants. In short, control is going to require a concerted program over a period of years. The alternative is to lose significant sections o/f beach with consequent loss of natural beauty, recreational use, and property values. When the permitting process is completed, BIPOA is expecting to coordinate a joint effort with MDNR, the CMU Biological Station, and the townships to contact all shoreline owners by mail and give them an opportunity to participate or reject treatment in this program. In the meantime, early onset of the weed can be dealt with by pulling stalks and runners and burning or bagging smaller plants. Phragmites are most often found in wet areas of plant growth, not on dunes or plant-free sand-and-rock beaches. We are writing to express our grave concern about the growth of phragmites australis (Reed Grass) on Beaver Island beaches. As a shoreline property owner, we want you to be aware of this exotic species, the harm it can cause and the possibility of eradication. 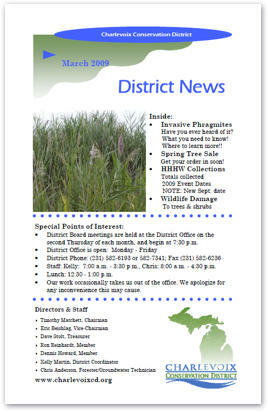 Information about phragmites has been published in both island newspapers and in the BIPOA newsletter and there is currently an exhibit at the library with specimens of the plant and extensive information about its growth and development. If you have walked the beaches of the island, you are aware that there are large areas where phragmites is thriving. One of these areas is Cable Bay. The phragmites in this area is extensive and dense. Please view this site to see how destructive this plant can be. However, Cable Bay is not the only area where phragmites is abundant. There are hearty patches all around the island: on Sand Bay, at the south end of Donegal, near the boat dock on Lake Geneserath, along Wicklow Beach, on Western Shores, along Iron Ore Bay, Green’s Bay, Back Beach and Bonner’s Landing. We are not being alarmist when we state that phragmites is invading our beaches. The Northwest Community Health Department, BIPOA and the DNR are in the process of planning a treatment program for large areas of this invasive beach grass growing on state land on Beaver Island. Effective treatment is dependent upon: proper identification, application of the correct herbicide in the correct application dose and the correct season for application. Small areas of growth are best removed by shovel as soon as they are identified. Care must be taken in destroying the rhizomes; improper discarding of the plant may lead to propagation to another site. The DNR is presently doing a survey to determine the location and size of all of the patches that can be seen from the air. They are doing GPS locations and will determine whether the patches are on public or private land. The DNR also plans to begin a program of eradication on public lands this fall. It is anticipated that this will be a 3-5 year program. This program of possible eradication on public lands is very positive; however, unless private property owners also work toward eradication, the problem will persist. It is extremely important that owners of shoreline property become educated and active in addressing this problem. Ideally, neighborhood groups could schedule treatment to coincide with the DNR eradication program, which will begin this fall. We urge you to consider carefully the importance of addressing this problem. All of us enjoy the wonderful beaches of Beaver Island. Can we protect them for current and future residents?